Best quality for use as filler, lime aggregate or for gesso ground. Extra fine grind 5-6 microns. Contains trace amounts of silica. Q: Hi. Why is marble dust noted as a carcinogen (in California), while whiting is not? Is it because of the smaller micron size? Also, why the extra shipping on both this product and on whiting chalk? Thanks. A: California lists the Marble Dust as a toxic substance, because it contains trace amounts of silica. The chalk may also get that rating soon. The ratings change every year. Both the Marble Dust and Chalk are very heavy materials and shipping becomes expensive. The listed prices are actually discounted. 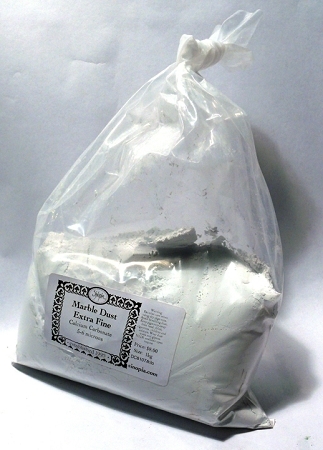 Q: I am looking for marble dust to use in plaster casting. Would you recommend the fine or more coarse dust to make a harder molded object? I plan to use it in a ratio of 40% marble dust with the plaster. A: We would recommend the Fine Marble Dust, unless you want a rough texture on your plaster cast. 40% ratio may be a little high. We would recommend more of a 10-20% ratio. A: Yes, our marble dust only contains crushed marble and is often used in all kinds of plaster finishes. We do not carry any other grades of marble dust.